Egypt's interim president says that talks to end the crisis in the country have failed. Announcement may set the stage for more clashes. Egypt's interim president, Adly Mansour, on Wednesday blamed the Muslim Brotherhood for the "failure" of international talks aimed at resolving Egypt's political crisis, Al Jazeera reported. 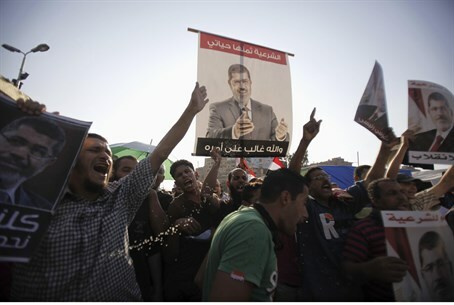 Mansour warned supporters of deposed president Mohammed Morsi that the government will not make any concessions to them. "The train of the future has left the station," he was quoted by Al Jazeera as having said in a televised address on Wednesday night, marking the end of Ramadan and the beginning of the Eid al-Fitr holiday. "It's moving forward, and all of us have to catch it." Earlier, the presidency announced the end of foreign-led efforts to resolve the turmoil, which has been spiraling since the army toppled Morsi on July 3. In a statement carried on state news agency MENA, it said, "The Egyptian state ... holds the Muslim Brotherhood fully responsible for the failure of those efforts [by foreign envoys] and what may be the consequences of this failure." Prime Minister Hazem el-Beblawy warned, meanwhile, that the government's decision to clear the ongoing pro-Morsi protests is "final," and urged demonstrators to leave, saying they had "broken all the limits of peacefulness". "The government's patience to bear this is nearly expired," he said, adding that any use of weapons against policemen or citizens would "be confronted with utmost force and decisiveness." Foreign envoys from America, Europe, Africa and several Gulf Arab states have been visiting Egypt in the past month, with little success. The government had allowed the envoys to visit jailed Brotherhood leaders in order to give a peaceful solution a chance. On Tuesday, two senior U.S. senators on a mediation mission said they considered Morsi’s removal to have been a military coup - causing an uproar in the Egyptian media and drawing a strong riposte from the acting president. The Republican senators - Lindsey Graham and John McCain - also called on the military to release political prisoners and start a national dialogue to return Egypt to democratic rule. The interim Egyptian government’s announcement could set the stage for a showdown with pro-Morsi protesters who have been camping out at Rabaa and al-Nahda in Cairo. Thousands of pro-Morsi protesters have camped out in the capital, demanding the reinstatement of the leader, and rejecting proposals by the interim leadership. They say that several of their political leaders have been detained illegally, including Morsi himself. Almost 300 people have been killed in political violence since the overthrow, including 80 Morsi supporters shot dead by security forces in a single incident on July 27. Meanwhile, the United States on Wednesday urged the Egyptian military and the country’s bitterly divided political factions to resolve their differences through dialogue and agree on a return to democratic rule. “Over the course of the last several days, envoys of the United States, the EU, the UAE and Qatar provided constructive ideas to the Egyptians in order to help prevent further violence and help advance the transition to a democratically elected civilian government,” said State Department spokeswoman Jen Psaki, according to AFP. Psaki told reporters that McCain had not been representing the United States on his visit. Graham and McCain said last week they were being sent by President Barack Obama to Egypt. “We absolutely do not believe that the time for dialogue has passed. We will continue this conversation, and it certainly remains a priority of ours and obviously a priority of the EU and other officials around the world who’ve been involved,” Psaki said, according to AFP.